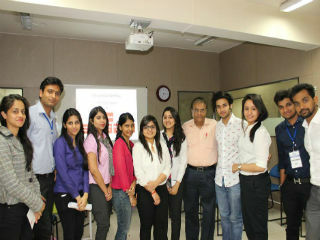 A workshop on “Leadership and Decision Making Through Team Building” was organised at Pearl Academy of Fashion (Narayna Delhi, main campus) for FBM students by our PGDM students’ team under the mentorship of Professor SC Kapoor on 9th April, 2015. 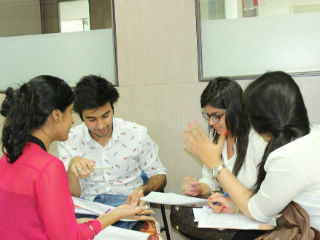 The uniqueness of the workshop was that it emanated a rare experience of learning, performing, involving and evolving an aura of team spirit. 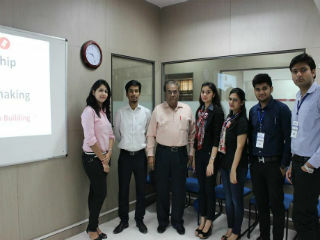 The students were thrilled to find and feel the live application of management principles throughout the workshop. The participants enjoyed each stage of the event to its fullest extent. The organising team comprised of Ms. Tanya, Ms. Himanshi Saini, Ms. Riya Chawla, Ms. Kanika Handa, Ms. Priyanka Chaudhary, Mr. Harsh Bansal, Mr. Harsh Vardhan, Mr. Anurag Shrivastva, Ms. Saumya Chaudhary, Ms. Riya Bansal and Ms. Arushi Ohri all from PGDM General specializing in HRM, marketing and finance. 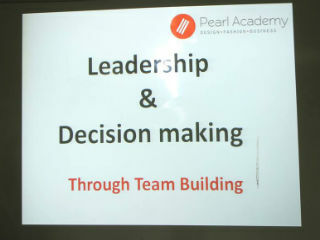 The workshop provided exposure to the concepts to the live situation and as well gave focused exposure to the participants of PEARL to have a feel of the management concept and practices.